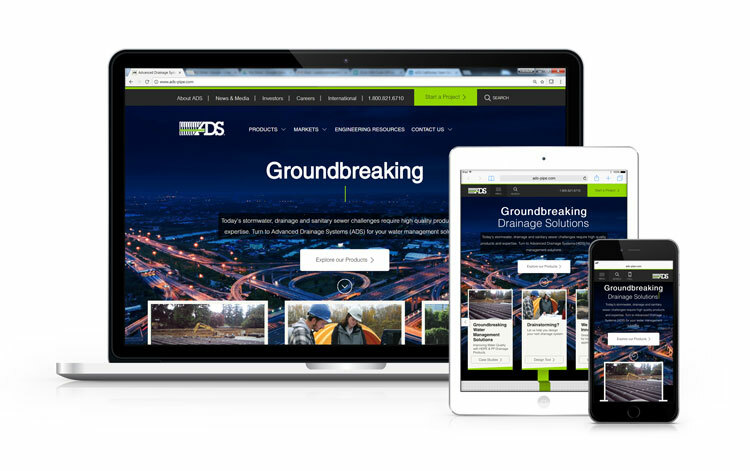 Hilliard, Ohio — Advanced Drainage Systems, Inc. (ADS), a manufacturer of high-performance thermoplastic corrugated pipe and ancillary products, improved the functionality and increased the number of free online design programs and documents available on its website (www.ads-pipe.com) while making it more responsive across all platforms including mobile devices. The engineering library resource database available on the website now includes more than 850 reference documents with specific information for each of the 14 end markets served by the company plus the company’s products including N-12, HP Storm and SaniTite HP pipe. Quick links go directly to the Drainage Handbook, CAD drawings, finding a representative locator and employment opportunities. Design tools to support a number of its allied product lines include the StormTech Design Tool, Nyloplast Drain Basin Configurator, FlexStorm Project Configurator and Inserta Tee Configurator. Additionally, the ADS Installation Guides App and the ADS Agriculture Drainage Resource App, which are available at the App Store and on Google Play. Additional information is available at www.ads-pipe.com.